Caitlin Barrow, Atlanta Loves You! 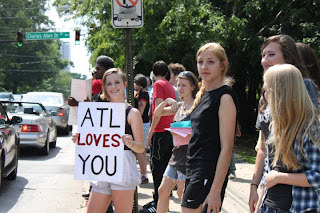 This week the AFSC-Atlanta office loses a valuable staff member, and AFSC has decided it's time for a long overdue look into what has driven this dynamic intern to become so dedicated to social justice work over the last several years. 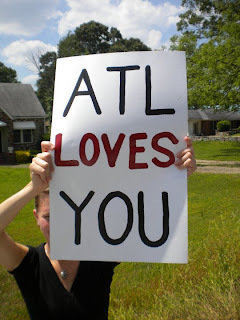 Caitlin is leaving Atlanta to take a year off from school to travel. We look forward to her swift return, but until then...we'd like to recognize the incredible work Caitlin has been doing and encourage her to continue it wherever her journey may take her. 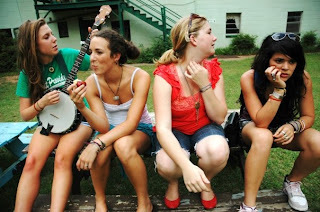 Caitlin's connection with AFSC begins in 2007 in Brunswick, GA, where she was attending high school. 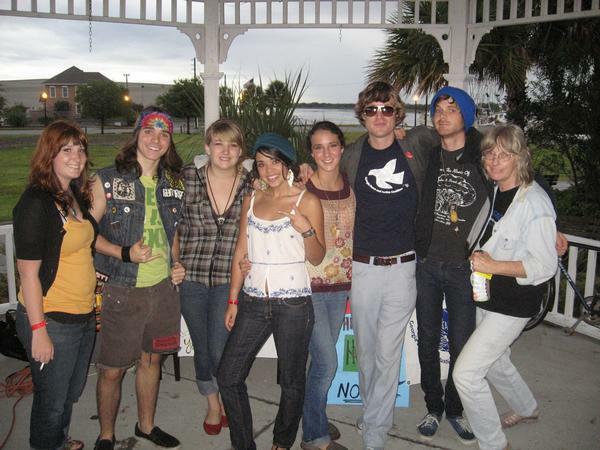 That year the State of Hope (Eyes Wide Open) tour came through Caitlin's town. 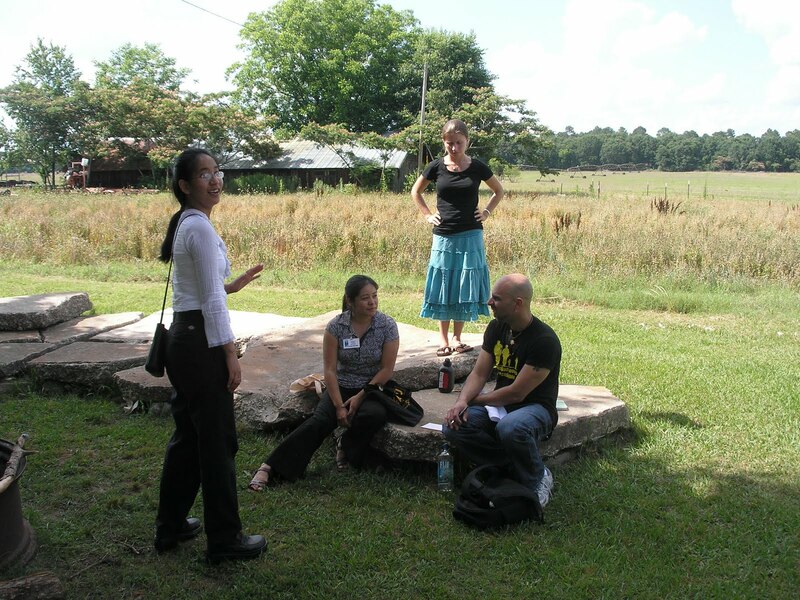 She was so moved by the tour that she decided to get involved in peace and justice work. 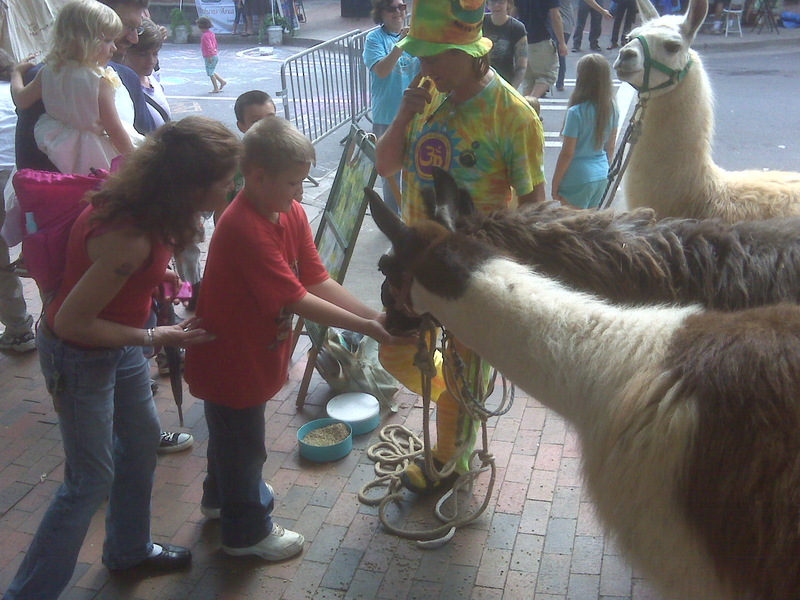 Tim made a deal with her that next year's tour would come through Brunswick again if she would organize it. 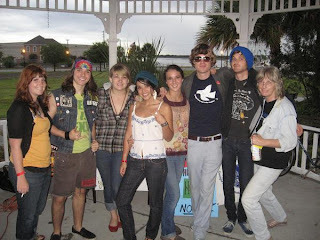 True to her word, Caitlin got all her friends together and helped organize the stop for the 2008 State of Change Tour. Throughout the year of working on this event, she became active in the local Glynn Peace group, where she formed the Glynn Peace Youth Division to get more young people involved. 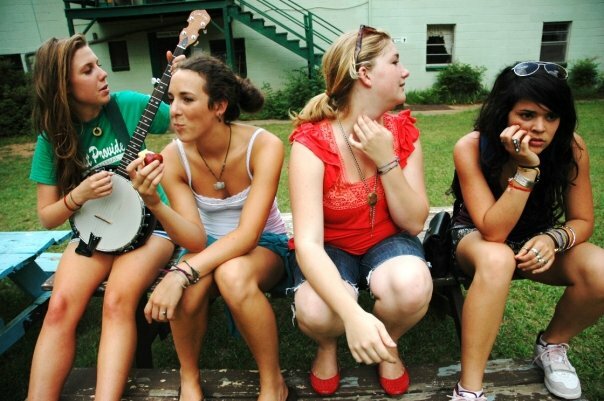 In 2008, Caitlin graduated from high school and moved to Atlanta to attend Georgia State University. 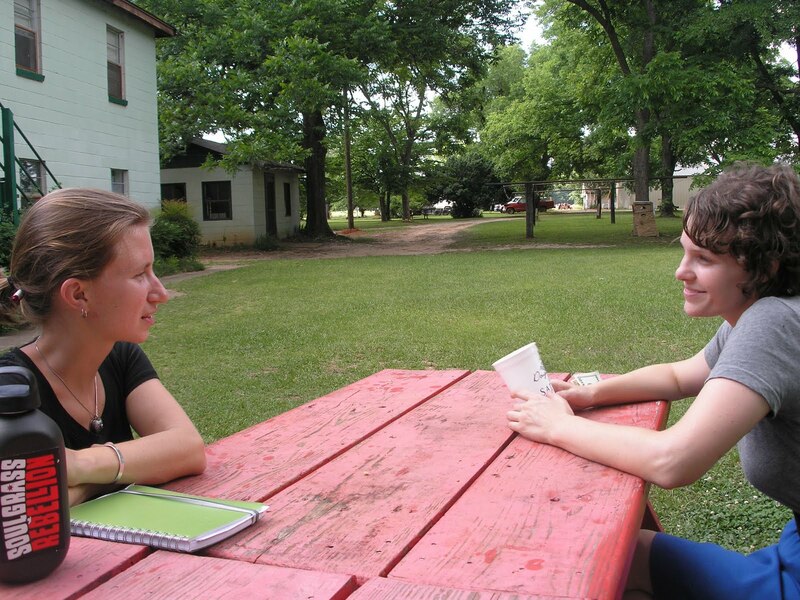 She continued her involvement with AFSC more directly and eventually came on staff as a part-time intern. 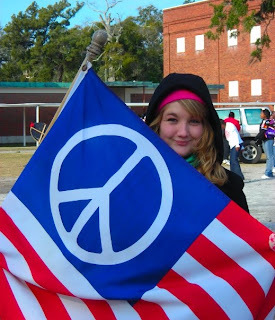 She started the Progressive Student Alliance at Georgia State University, which has grown into a vibrant, multi-issue group that has taken on countless important projects. 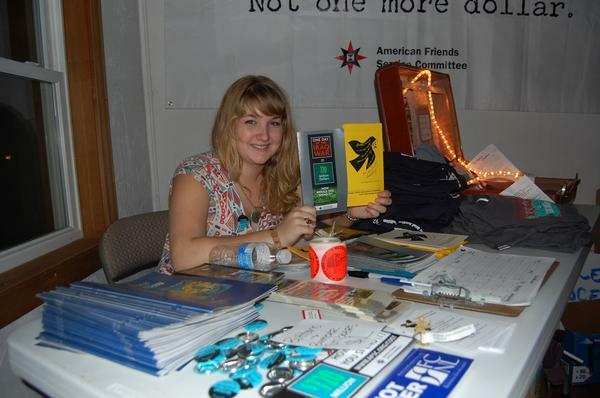 She helped organize the Cost of War speaking tour, the "Be the Change" Youth Convergence, and the ongoing legislative efforts to limit recruiters' access to young people. We asked Caitlin a few questions about her work, and here is the gist of what she said. Q: What's your motivation for doing this kind of work? A: The more I learn about injustices and how they're interconnected, the more upset I get and the more I recognize the need for change. I wouldn't feel comfortable with knowing all the things I've learned and letting these things go on. Q: Were you exposed to these ideas a lot growing up? A: Not in the political context. My parents are Catholic and taught us to really take care of people, and I just kind of transferred that to the bigger picture. Q: What has been your favorite part of your work? A: Networking on the state-wide level because it's so important for the rural areas and pretty f****** radical--more radical and impactful in the small towns. Q: What's the take-home message that you've gotten from this work? A: You have to look at things from different contexts. You can see different forms of oppression and can't turn your back on that. Everything looks different. Q: What skills have you gained from your work? 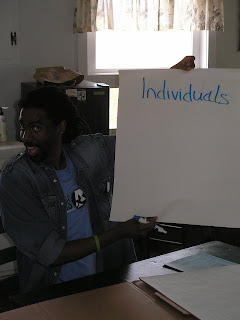 Q: How do you see yourself being involved in social justice work in the future? A: It's changed my attitude and made me more proactive. I'll always be involved in some capacity. 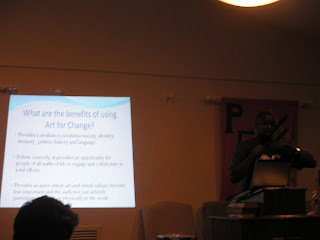 I want to be an art teacher, so staying involved in art and education will be big. Q: What are you going to miss? A: Friends and relationships, that personal connection with everyone here working for a common purpose. Caitlin left an immeasurable impact on all whose lives she touched and the whole state of Georgia. We here in the Atlanta office cannot express how proud we are of Caitlin's many accomplishments and how much we are going to miss working alongside her. We wish her the best in all her travels. 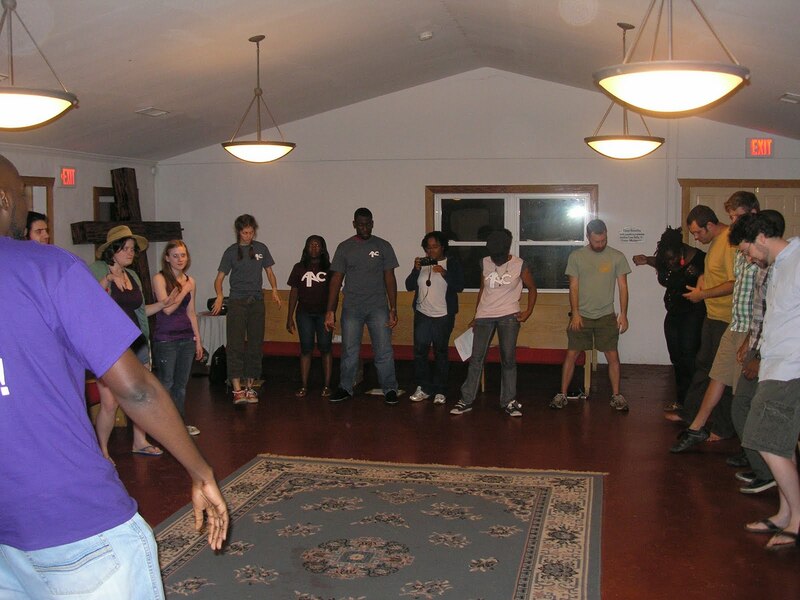 Six months ago about ten young people from different parts of Georgia gathered in the basement of a coffee shop in Milledgville to decide if/when/ where there would be a second annual "Be The Change" youth convergence. the first youth convergence was held in May of 2009 and brought together youth activist from around the state to discuss the problems facing our communities. The grounding text for the weekend was Martin Luther King's, "Beyond Vietnam" speech in which he famously made the links between militarism, racism, and poverty. 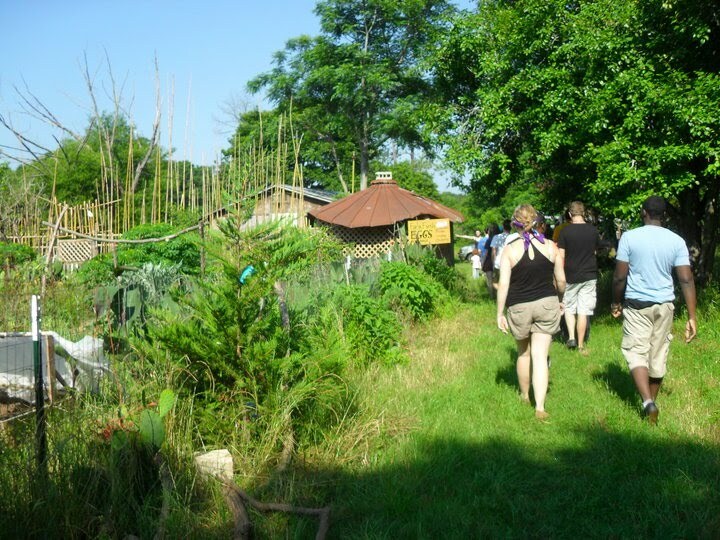 The gathering was hosted at the historic Koinonia farms, a somewhat forgotten place of importance to the civil rights movement and the birthplace of habitat for humanity. Last years convergence sparked a counter military recruitment campaign that stretched across the whole state. There was multiple street actions, graffiti, stencils, and wheatpastings, a proposed publicly funded Marine Corps themed high school was halted in it's tracks, and two joint pieces of legislation were introduced in the Georgia House and Senate. Not to shabby. So back to that coffee shop basement in Milledgville. After some discussion about how the first "Be The Change" went the group found a conscientious. "Be The Change" 2010 needed to happen, now more then ever. 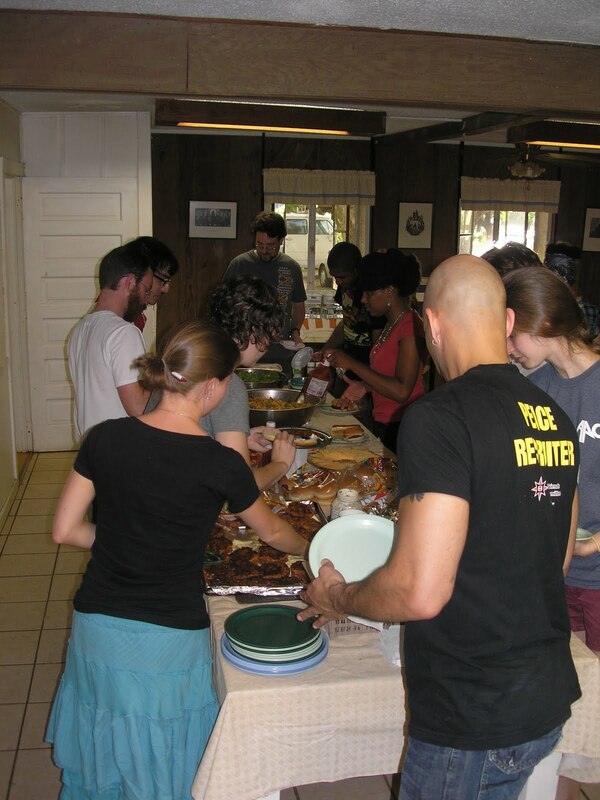 The group also wanted to stay rooted in Dr. King's message, and we wanted to keep the convergence at Koinonia, despite knowing that it limited the number of folks willing to make the journey. The group also wanted to stick with the original format. 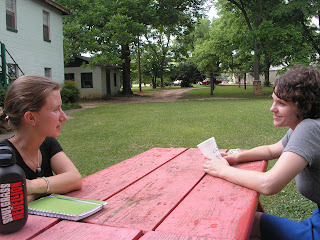 We would learn about how militarism, racism, and poverty affected Georgians and how these issues where linked. We would learn how to use established tools to build movements and campaigns around these issues, and we would pick an issue and build a campaign strategy that would be implemented throughout the year. 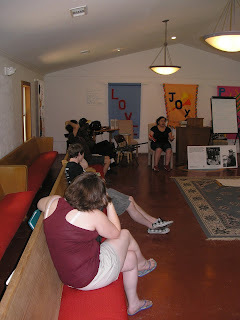 I'm happy to report that the 2010"Be The Change" youth convergence was a big success. 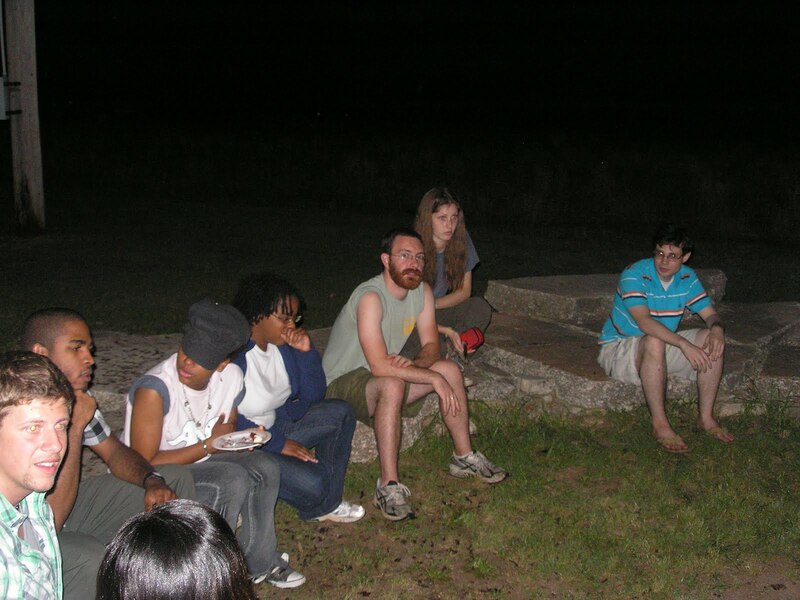 We had high school and college students and organizers from Milledgville, Athens, Henry County, LaGrange, Atlanta, Aiken, Birmingham, Americus, and Statesboro. There were facilitators from all over the country that provided dynamic interactive education sessions and plenty of opportunities for youth to facilitate their own discussions about the problems that face Georgia. We had about a dozen outside facilitators and performers come in and provide us with information and exercises to help us better understand the links between various struggles to overcome injustices in Georgia. After taking time to process what we have learned it was time to pick an issue that we could build a statewide campaign strategy around, which was pretty difficult. Lots of issues were brought up during our brainstorming session. It was clear that folks wanted to confront militarization of our culture and the mind blowing human and economic cost of war. 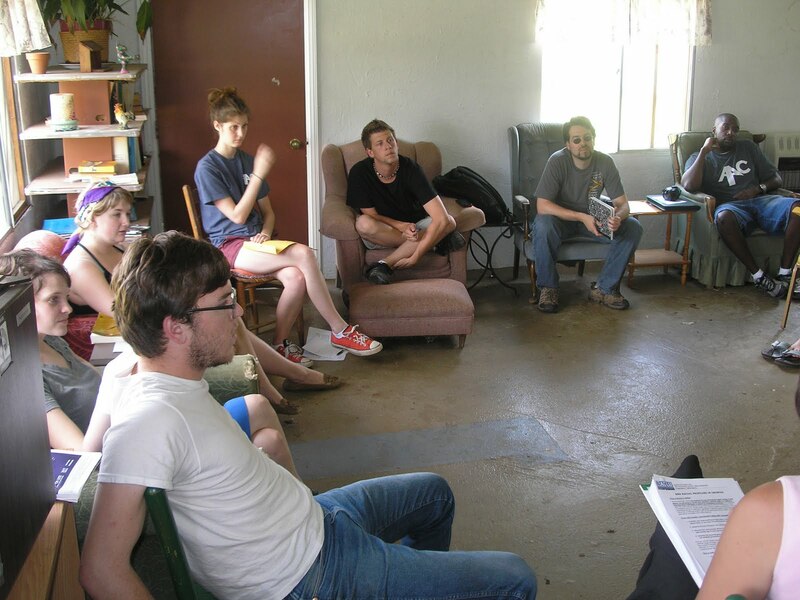 The discussion about racial inequities and spiritually bankrupt spending priorities lead the group to agree on an issue that directly effects young Georgians, Education. This year Georgia public schools are facing the most dramatic budget cuts in history. Teachers and school workers are facing lay-offs, schools are being shut down, college students are facing a 36% tuition increase. When are government cries for money to pay for war it rains cash, and the cost on programs of social uplift pay is staggering. It's time that we view the war budget for what it is, a robbery from our communities, our education system, our future. 1. EDUCATION IS A HUMAN RIGHT. 2. NO MORE FEE HIKES, TUITION HIKES, OR BUDGET CUTS. Students are not ATMs. We didn't cause this crisis, we shouldn't have to pay for it. 3. GEORGIA'S BUDGET NEEDS TO BE RE-ASSESSED. We don't want to fix this problem at the cost of other important programs of social uplift that are also being underfunded. We need to explore new solutions. 4. NO MORE FURLOUGHS OR LAYOFFS. We need our teachers and school workers! 5. TAKE LOCAL ACTION FOR BETTER EDUCATION. Lobbying Committee. This committee will help develop legislation campaign and work with Georgia lawmakers to introduce legislation that's in the spirit our our 5 points. Art Committee. This committee will be bringing the artistic energy to our campaign, developing street art, posters, stencils, maybe even public murals! 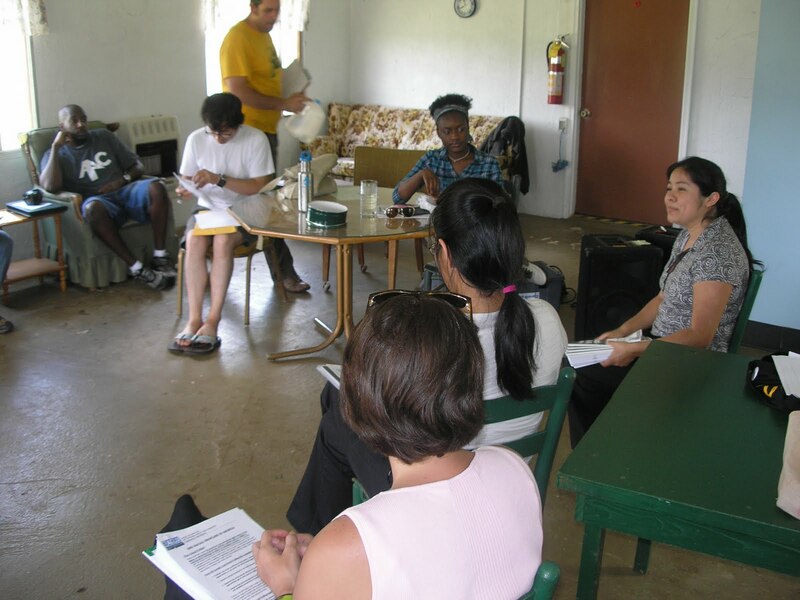 Community Action Committee. This committee will be planning street actions and working with local elementary schools to develop service projects. Media Committee. This committee will take on the important task of developing our messaging and exploring ways that we can tell our stories to the our communities. After our session we shared lunch and said goodbyes. Some of us stuck around for a pretty amazing intro to permaculture workshop put on by Koinonia. I had no idea that most of the worlds problems could be solved in the garden! Those of us that attended were pretty amazed at the permaculture concept and global movement. Koinonia Farm for providing space and amazing hospitality. We love you for all that you do. Art as an Agent for Change. Ya'll are the spirit of Be The Change! No one "Shuts It Down" like AAC! Cafe Campesino donated fair trade coffee, tea, and chocolate for the whole weekend! The Atlanta Friends Meeting House for donating funds to make the weekend happen. We hold ya'll in the light! The Georgia Peace and Justice Coaliton! The weekend would not happen if it where not for the statewide network and the Atlanta chapter. GPJC paid for the majority of the weekend. We are truly honored to be able to partner with GPJC and hope to continue the fruitful relationship! 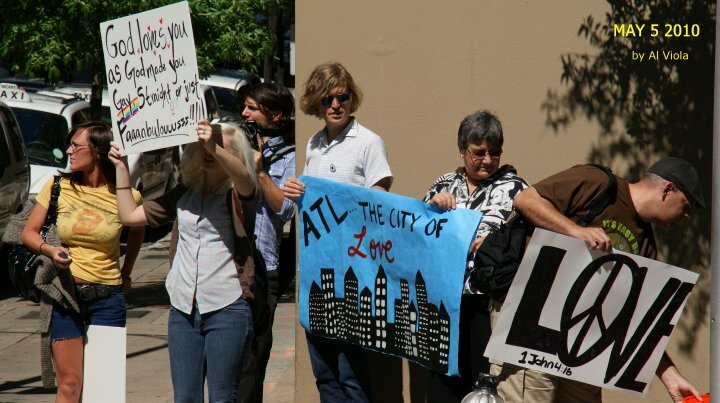 The Task Force For The Homeless called for a press conference to take place outside the walls of the shelter at Peachtree and Pine Yesterday at 12:30pm. The press release went out far and wide and the list of folks speaking was impressive. 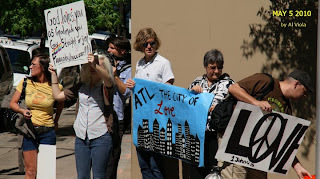 AFSC Atlanta had the honor of setting up the sound system and running sound for the rather large press conference. The message from each speaker and residents of the shelter was very clear: WE ARE NOT LEAVING. We heard story after story of how the shelter had transformed the lives of folks that had hit bottom as a result of economic strife, addiction, war related PTSD, and other struggles. The question was asked, "Where will you go when your pay check runs out?" That specific question had a lot of depth and weight in these tough economic times, so tough that our city is on the verge of evicting homeless people in favor of new commerce? After the Press conference members of the community, along with Task Force residence, formed a human chain around the massive building. AFSC was very excited to play a role in the effort and we look forward to taking on a task related role in the near future. SCAP Spends the Day at School! Yesterday Student Career Alternatives Program(SCAP), a project of AFSC, accepted the offer from the Horizon School to spend a few hours with the entire high school class to engage in a conversation about the realities of war, military service, non-military post high school options, and how the war budget effects Atlanta youth. The afternoon started with a viewing of the AFSC produced 14 minute documentary, "Before You Enlist" and was followed by a series of facilitated conversations and group exercises. During our discussion about the cost of war students seemed to easily draw the connection between the enormous military budget(about 1.9 billion a day) and the recent cuts in Georgia's education system(high school teachers being laid off, schools shut down, 78% tuition hikes for college students). 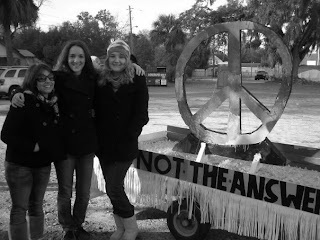 Horizon students also drew connections between the war budget and the foreclosure crisis, violence in schools, crime, addiction, Marta funding crisis, homelessness, and innocent civilian deaths in Iraq, Afghanistan, and Pakistan. Though many of the Horizon students already felt committed to find non-military post high school options, we had a lot of them thank us for arming them with new facts and giving them a deeper understanding of US foreign and it's effect on our communities right here in Atlanta. We were thankful for the opportunity to work with students at Horizon and look forward to building our relationship with the school. SCAP Benefit Concert, Dropping Truth With a Heavy Dose of Punk Rock! Andy Fritz, a 19 year old Organizer with American Friends Service Committee's Student Career Alternatives Program(SCAP), has been organizing and playing hip hop and punk rock shows for several years now. Recently he decided to bring his tow worlds together by organizing a punk rock benefit show for SCAP aimed at a younger crowd. 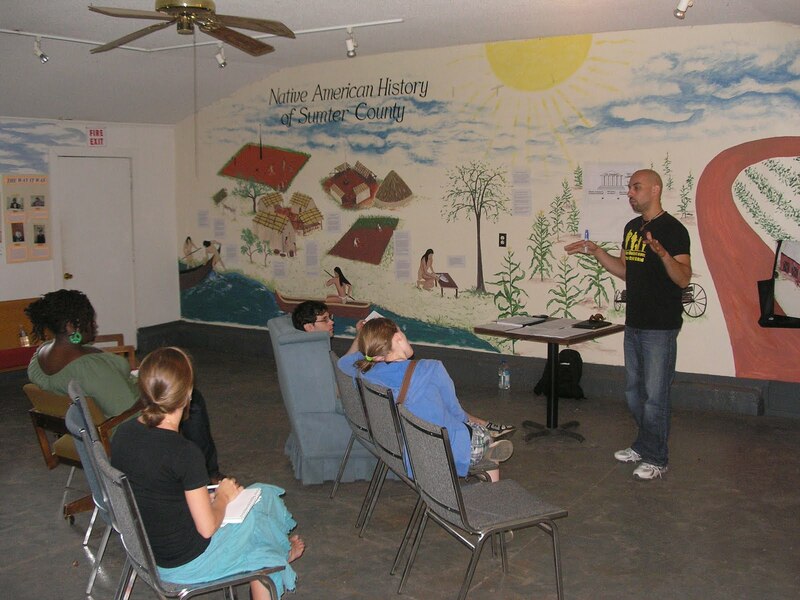 Andy stated, "I think a lot of my friends need to here this stuff, and I'm pretty good at talking to kids my age about it"
Andy first became active with SCAP last summer when he accepted an offer from our office to go to Chicago for a national counter military recruitment conference. 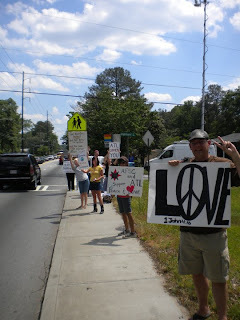 Since then Andy has consistently stayed active, organizing a his friends in Henry county, hosting street actions in Henry county, emceeing SCAP's Art Contest ceremony, even provided testimony to military recruitment abuses at a recent Senate hearing. One impressive aspect of the concert was the very short timeline in which it was planned. Andy threw the thing together pretty quickly and without any of our traditional outreach tools. I honestly thought it was going to be rather small. I was wrong. 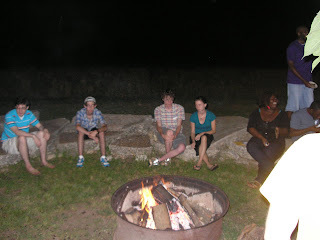 Andy managed to bring out a crowd of fresh young faces, many of whom I'd never seen before. 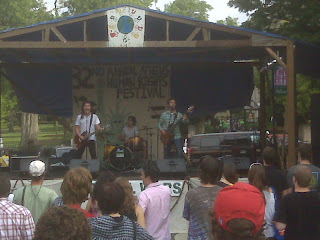 All the bands were really great and lots of folks asked questions about SCAP and the reality of military service. We gave out lots of literature and collected emails, epic win! So kudos Andy, keep up the good work! Oh, and a big thanks to WonderRoot Community Art Center to allowing us to use their space!! Wow, I must say that today was an emotional rollercoaster for me. I suppose that I could say that I had almost every emotional response I've ever had from a street action over the years rolled up in one day. The plan for the day was to support the student organizing efforts to counter picket the Westboro Baptist Church at two Atlanta area high schools, Druid Hills and Grady. 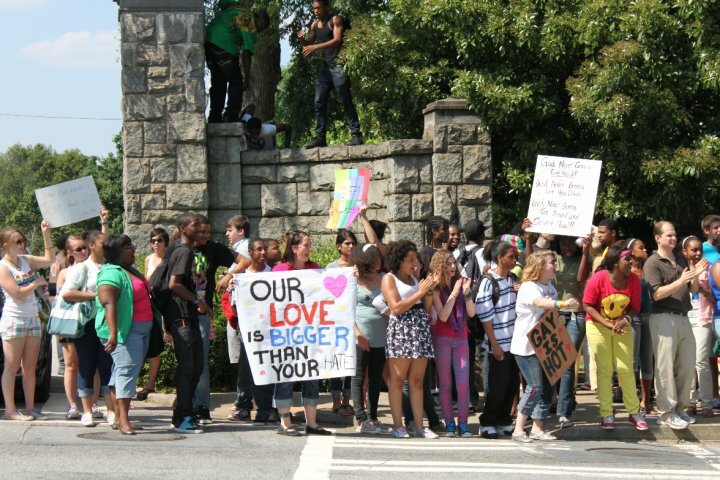 The Druid Hills picket was scheduled from 7:40-8:10am, right as students are showing up to school. Several of the students we had been working with had told us that the principle of the school had repeatedly told them that if they were seen joining the counter demonstration that they would be escorted by the police into the school and possibly arrested. I personally spoke with the principle and she confirmed this. My feeling is that her motive was to protect her students from physical and emotional injury but that doesn't justify ignoring their civil liberties, their right to confront the hate that had been brought to their community. Not only does the first amendment extend to public school property, the faculty has no right to attempt to control their students bodies off the school property before classes start. 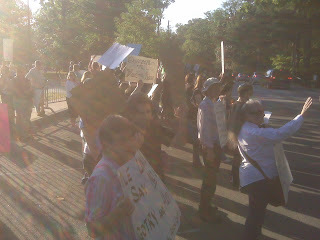 I was supposed to meet several dozen folks, including members of the press, at the school at 7:30am. Due to the intense traffic created by the police presence I did not get their till almost 8am. Most of the folks I was supposed to meet didn't make it in time. For the sixty of us that did make it we were confronted with perhaps the most unnecessary show of police force that I have ever seen in my life. That's a pretty bold statement for me. 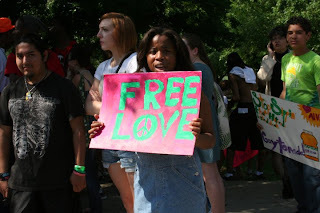 I've been to several international demonstrations, Including the G-8 in 2004, where we had tanks and missile launchers roaming through low income neighborhoods. 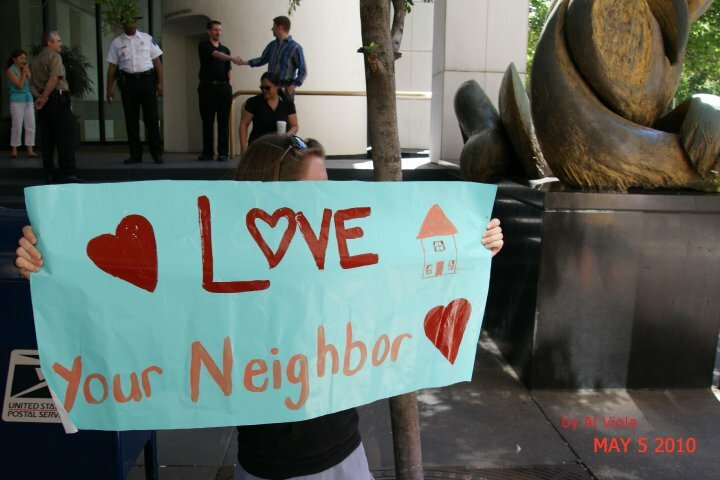 To protect seven WBC members the police created a free speech zone for counter demonstrators. I spotted dozens of officers in head to toe bullet proof suits, there were machine guns, at least six tears gas machine guns, rubber bullet shot guns, riot shields, all totally inappropriate for something of this size. For those that braved all those obstacles we did make the best of it. Passers by were all very happy to see the WBC wasn't the only group with a message that day. 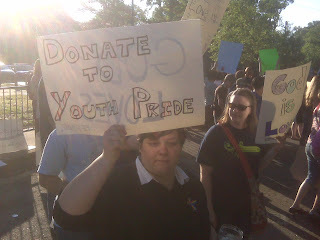 A jar was passed to raise money for Youth Pride, and students were seen cheering us on from inside their classrooms. As we left several students poked their heads out from their classroom trailers and gave us all a woot-woot. The next stop was what we had all decided was going to be the finale, Grady High School. One big difference between Grady and the other two high schools was that the Grady students had controlled the conversation about how the campus was going to respond as opposed to the faculty(though faculty did attempt to extend their control beyond legal limits). 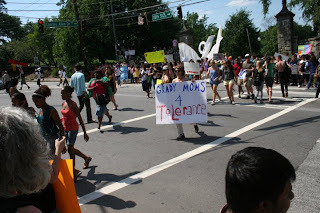 Grady student, Becca Daniels, along with several of her peers, had coined the counter demonstration, "Acceptance, Love, Tolerance" or, "ATL". Becca and crew had worked hard to instill a spirit of love and non-violence into the demonstration. They had also done a lot of prep work. Creating stencils for signs and tee shirts, developing a list of organizations to raise money for, and getting permission to use Piedmont park. I showed up 45 minutes early with banners\signs from the art party that we hosted earlier that week. We also brought big donation buckets and leaflets to pass out to folks who may not understand what was happening or what we were raising money for. Grady students were joined by hundreds of other students and community supporters. The crowd got so big that it surged into tenth street, effectively shutting it down at times. 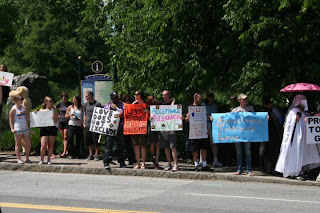 When the WBC decided that they had enough and started packing up hundreds followed them to their car to make sure they left. After WBC left it was clear that people were going no where. The Red Dog police unit, infamous for their aggressive behavior towards all things homosexual, made several attempts to clear the crowd. Eventually they claimed that there could be a bomb in the park and that everyone had to leave. The crowd simply decided to take to Monroe and 10th. The crowd of mostly students and some AFSC folks stuck around till almost 7pm. 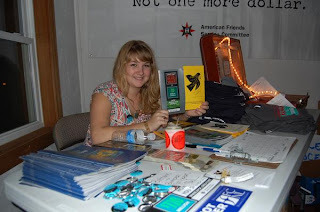 AFSC really had three goals in mind when we decided to organize around the WBC Atlanta visit. 3. To help raise money for the very causes that the WBC objects to. Seeing things through the lens of our goals I can honestly say that the WBC's visit was a blessing. 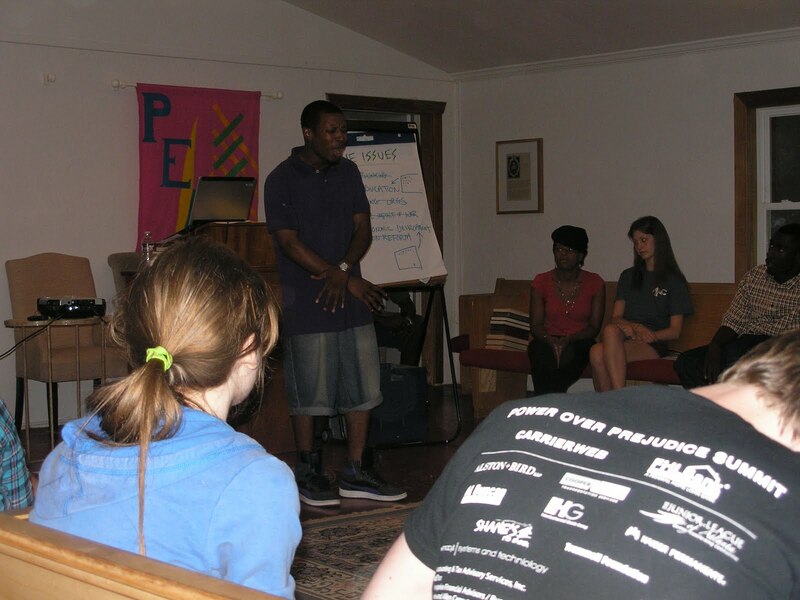 Not only did we get to see amazing young people, like Becca Daniels and her peers, step and lead their campus, we had the opportunity to lead a workshop on confronting hate at the Horizons school, and create conversations all over the city about the homophobia and intolerance that exists in our community everyday. Groups like the WBC represent the fringes of public opinion in America, but it should be noted that when you take a short walk away from the edges of those fringes we find all kinds of nasty beliefs and fears rooted within our hearts. This week created opportunities to talk about the roots of these beliefs, and perhaps make steps to uproot some of them. We also raised close to $1000. over the course of two days, the final number will be in by this weekend. A walk through the crowd. Two hours later there's still a crowd on Monroe. 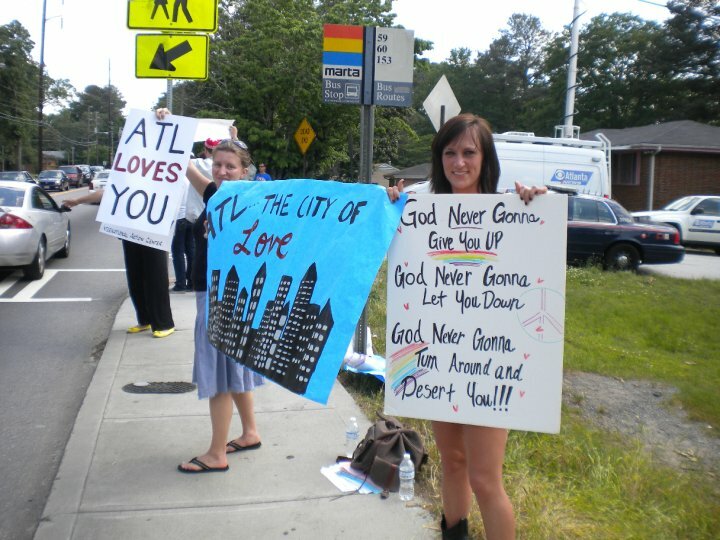 This morning some of us were still unsure whether or not the infamous Westboro Baptist Church would actually show up in Atlanta. 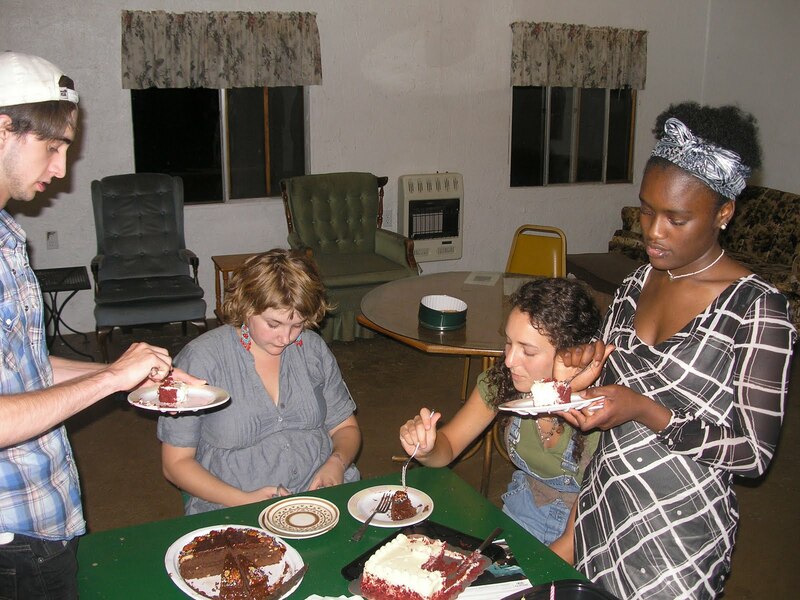 We had heard that they often promote visits that they end up not turning out for. I honestly had sort of hoped that they wouldn't show. 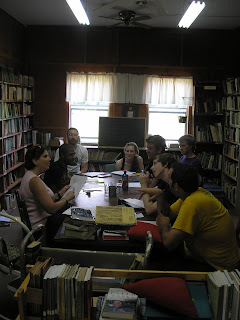 A small group of us gathered at AFSC this morning. 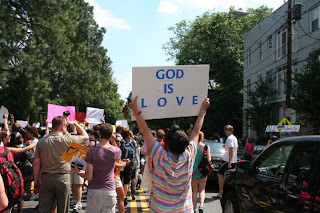 Before we left there was a brief discussion about how we would react to when we actually came face to face with signs that said, "God Hates Fags". Though there had been extensive discussion on the dynamics of the Westboro cult, and there was a general conscientious that many in the group were actually victims, there was still a knowledge amongst our group that some might have difficulty containing emotional responses to the hateful messages. At 9:45am we received confirmation that WBC was on their way to their first target in Atlanta, the Marriott. 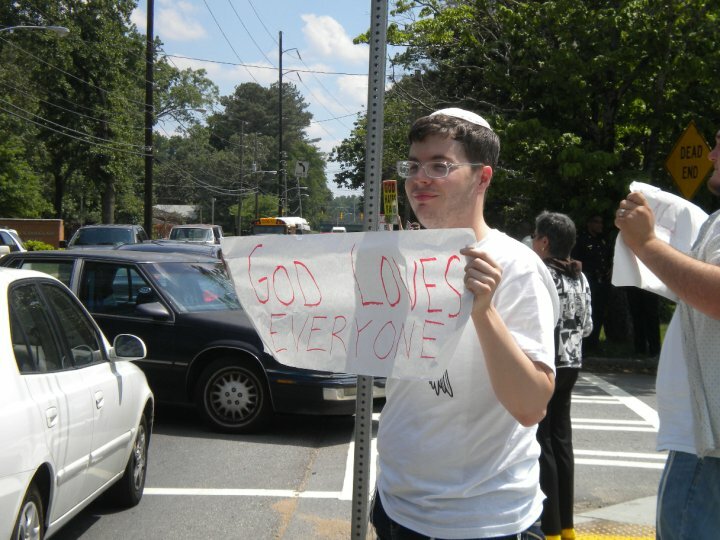 They were planning to protest a Jewish Convention. When we showed up, they were there. 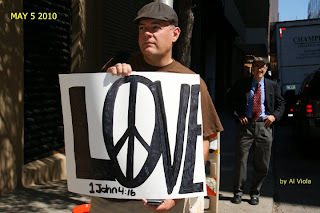 We weren't the only counter demonstrators. There we two young Jewish men from a group called PunkTorah and several Veterans. As we stood there holding our love promoting signs and passing out leaflets I couldn't help but feel baffled at how this group could have such conviction about their hate. 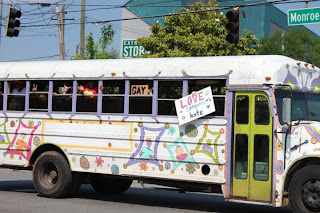 It was clear that this was a highly disciplined group that goes to great efforts to get their message out, which is basically, "God hates us all and we're going to hell". Hopefully by this weekend we'll have an idea about how much money the WBC visit ended up raising for these important organizations. We ended up following the WBC to Douglas High School. 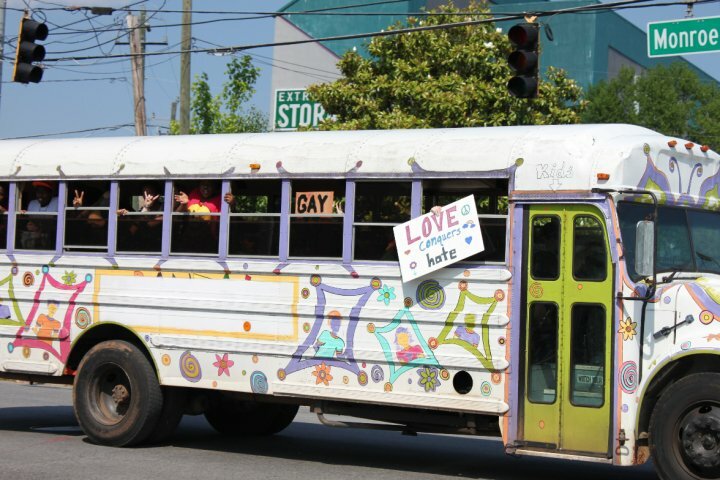 The WBC had planned to picket the school right as class let out for the day. 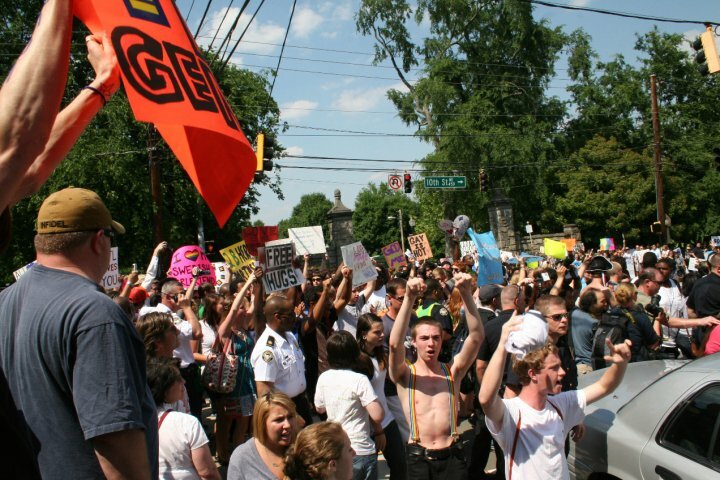 When we showed up it was clear that the faculty had gone to very far lengths to limit the WBC's access to their students, it was rather impressive actually. 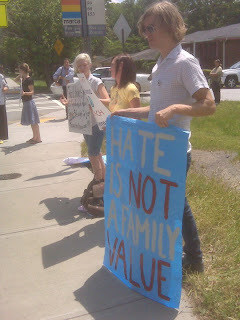 We were all glad that we had devoted the day to counter the WBC's presence at Douglas. The faces on parents and community members as they passed the WBC was one of shock. There were multiple folks that did several drive byes. Parents and folks in the neighborhood really appreciated our presence. So tomorrow is the big day and we're all looking forward to celebrating love and diversity with Grady students and others at Piedmont Park 3-4:30pm. You're invited! We were invited to speak at the 31st annual Athens Human Rights Festival which took place May 1-2. 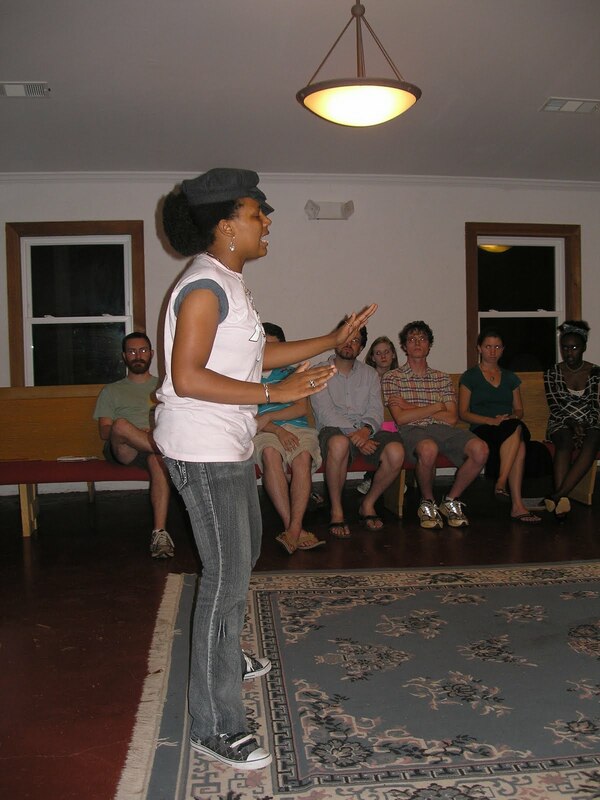 This years festival's focus was immigration reform. The festival started in 1979 in commemoration of the four Kent state students that were killed when the national guard indiscriminately opened fire during on a non-violent anti-war demonstration on the campus. 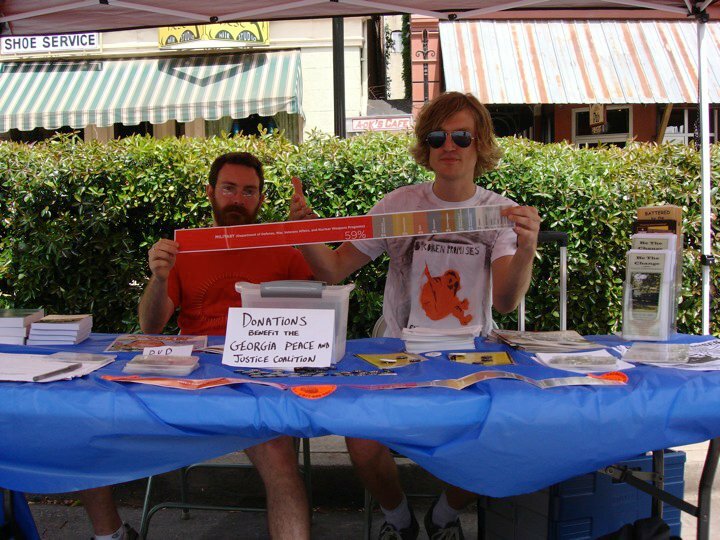 With the help of Mitch Roper, with the Georgia Peace and Justice Coalition, we set up an information booth all weekend. The festival was a great opportunity to hear great music, network with other great organizations, and hear a number of dynamic speakers. 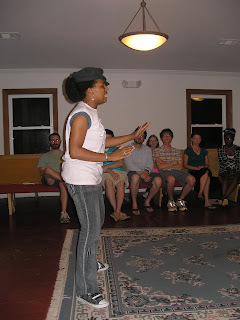 We were invited to speak about the true human cost of the militarization of our culture. Of course Athens is no stranger to the cost of our bloated military budget, which represents 59% percent of our spending this year. As a result of of the massive amount of money that goes to support fighting wars and arming the world UGA students will likely face a 78% tuition increase, families in Clarke county will have their homes foreclosed on, and local high school students will be forced to learn first hand about the poverty draft. It is time that we begin to see each dollar spent on these wars as a robbery from our communities, that every Iraqi/Afghan/Palestinian civilian killed in these wars is an shameful smudge on our national consciousness, and that if our national priorities are to change that we must be the agents of that change.